Fish Passage Assessments - Meridian Environmental, Inc.
Meridian designed, fabricated, and installed a remote PIT-tag detection system in the Prospect No. 3 Hydroelectric Project fish ladder. Four individual PIT-tag antennas were continuously monitored using an Oregon RFID half duplex multiplexer-reader. Meridian PIT-tagged resident trout and introduced them into the ladder to document upstream fish passage success and timing. Meridian also conducted a mark-recapture test to determine fish entrainment and injury rate through the project intake fish screens and fish bypass system, and used PIT-tagged fish to measure fish screen bypass travel time. To support a NEPA evaluation and downstream fish passage alternative development at Clear Branch Dam in the upper Middle Fork Hood River basin, Meridian developed, managed, and coordinated a study to quantify juvenile (hatchery spring Chinook salmon smolt) and adult salmonid (hatchery rainbow trout) injury and survival of fish that pass down the dam's spillway. 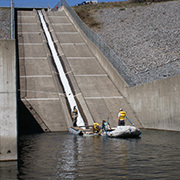 Test fish were sent down the spillway at high and low flows. Treatment and control test fish groups were recaptured with a rotary screw trap and a fyke net trap. Field data collection was also supported by U.S. Forest Service, Oregon Department of Fish and Wildlife, Confederated Tribes of Warm Springs, and Middle Fork Irrigation Staff. Meridian developed the study plan including sample size estimates, and conducted all data analysis and reporting. 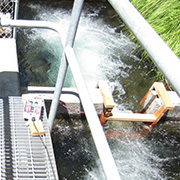 As part of the overall study, Meridian collaborated with the Confederated Tribe of Warm Springs to estimate fish migration timing over the spillway and associated spill rates using PIT tagged hatchery spring Chinook and PIT tag interrogation systems located at the spillway crest and downstream. Using radio telemetry, Meridian biologists assessed the migration rates and survival of salmon and steelhead smolts as they moved through the lower 50 miles of the mainstem Cowlitz River. The effects of pulsed flows on the migration timing of each species were determined. We conducted all aspects of the study, including design, setup and maintenance of the telemetry arrays; radio tagging hatchery and naturally produced coho, Chinook and steelhead; mobile tracking; and data analysis and reporting. Since 2012, Meridian field biologists have assisted PacifiCorp with seasonal operation of the Lewis River Hydroelectric Project fish passage facility from about October through June each year. We help operate both the Merwin trap to transport adult salmonids upstream and the Swift Floating Surface Collector to transport juvenile salmonids downstream. 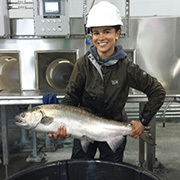 Our biologists perform juvenile and adult fish identification, handling, sorting, juvenile salmonid PIT-tagging, data entry, and facility cleaning and debris management. 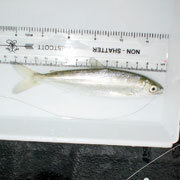 Species handled typically include bull trout, steelhead, cutthroat trout, rainbow trout, and Chinook and coho salmon. 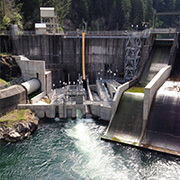 Meridian led a hydraulic and biological evaluation of newly installed fish passage facilities (upstream fish ladder and downstream fish screens) at the North Umpqua Hydroelectric Project. Meridian biologists used videography to describe fish behavior (with emphasis on adult steelhead and spring Chinook salmon), identify areas of the ladder that may inhibit passage, and evaluate fish injury and mortality rates associated with passage of downstream migrating juvenile spring Chinook salmon through the fish screen. Meridian also conducted an underwater videography evaluation of the Soda Springs and Slide Creek tailrace barriers to determine if they delay or injure to adult anadromous salmonids. Meridian designed and conducted fish entrainment studies at the outlets of Lake Keechelus and Lake Kachess dams over a 2-year period, focused primarily on evaluating bull trout entrainment. Meridian employed a screw trap and hydroacoustic technology to measure continuous fish entrainment rates over the 4-month survey period at Lake Keechelus. 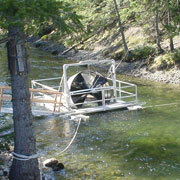 At Lake Kachess, we used a screw trap and experimental fyke net trap to measure fish entrainment rates. Meridian custom-designed and built the experimental fyke net and screw trap cable rigging system to ensure that these structures would remain in place and perform effectively throughout the survey period.